Legend has it that coffee was discovered when a goatherd named Kaldi noticed his goats dancing near a dark-leafed shrub with red berries. Kaldi found that the berries on this shrub caused the goats’ eccentric behaviour, and soon Kaldi was dancing too. The earliest credible evidence of either coffee drinking or knowledge of the coffee tree appeared in the middle of the 15th century in the Sufi monasteries of Yemen near the southern tip of the Arabian Peninsula. Europeans initially assumed coffee originated in Yemen, where Europeans first found it cultivated. But botanical evidence indicates that Coffea Arabica, the finest tasting of the hundreds of species of coffee and the one that turned people all over the world into coffee lovers, originated on the plateaus of central Ethiopia. From Ethiopia, coffee spread to Egypt and Yemen, and by the 15th century it had reached Armenia, Persia, Turkey and northern Africa. From the Muslim world, coffee spread to Italy, then to the rest of Europe, to Indonesia and to the Americas. Nobody knows how it got from Ethiopia across the Red Sea to Yemen, but it could have been during the Ethiopian rule of Yemen for some 50 years after the Ethiopians invaded southern Arabia in 525 AD. Coffea Arabica has been cultivated in Yemen from the 6th century onwards. In Arabia coffee was first mentioned as a medicine, then as a beverage taken by Sufis in connection with meditation and religious exercises. From there it moved into the streets and virtually created a new institution – coffeehouses. By the 16th century, coffee started to spread across the world. The French, Dutch and Portuguese all became interested in making money from coffee cultivation. But coffee would not grow in Europe because the coffee tree does not like frost. At the beginning of the 18th century, the Dutch took coffee to Ceylon (Sri Lanka) and then to Java to start growing it commercially. By this time, coffee was enjoyed by the rich and famous in Europe. Coffee came from Mocha, the main port of Yemen, or from Java. Soon the two coffees were blended to become Mocha Java. Coffee has become a major export commodity. In 2004, coffee was the top agricultural export for 12 countries, and in 2005, it was the world's seventh-largest legal agricultural export by value. The coffee plant Coffea is a genus of the Rubiaceae family. The two main species from which most commercial coffees come are Coffea arabica and Coffea Canephora. The latter, also called Robusta, has far less of the desirable flavours as do Arabica, despite its better resistance to pests and diseases and its higher yield. Robusta makes up less than 30% of the world’s coffee production and is primarily used as a blend in soluble (instant) coffee. It has more caffeine than Arabica. Arabica, making up 70% of the world’s coffee production, grows best at high altitudes of between 1 000 meters and 2 500 meters and around the equator between the Tropics of Cancer and Capricorn. Arabica has many varieties of which typica and bourbon are the most distinct and well-known. It thrives on loamy, volcanic soil rich in nitrogen, potash and phosphoric acid. The plant develops lush, evergreen foliage as a small shrub or can grow as high as 18 meters if not pruned to make harvesting easier. It bears green fruit, called berries, after four to five years and remains productive for 20 to 25 years if properly tended to. These green berries, which replace the jasmine-scented flowers which last only a couple of days, turn into cherries after several months. Once ripe and red, they are ready for picking. The harvesting process can be mechanised, but the disadvantage of this is that underripe and overripe fruit also become part of the harvest which, if not sorted properly, can seriously compromise the quality of the coffee. Therefore, hand-picked, ripe-only Arabica beans ensure consistent quality. Wet process (washed beans): This process is more expensive and it starts with washing the coffee in large tanks. The beans then follow channels of running water to remove the outer skin and some of the pulp. Next, the beans are put in fermentation tanks where natural enzymes take about 36 hours to break down the remaining pulp. This process must be carefully controlled to prevent the fermentation process from harming the beans. 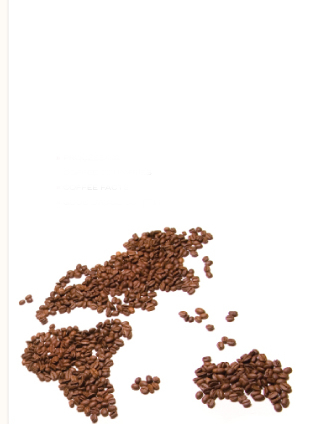 The drying process that follows is much shorter than that of dry-process beans. Wet-process beans are dried in the sun or in low-temperature drying machines until the moisture content is reduced to about 12%. The beans, still in their protective parchment, can now be stored for several months before removing the parchment, and polishing, grading and bagging the green beans. Dry process (unwashed beans): This is also called natural coffee and entails the spreading of the beans on patios or raised platforms in the sun where they are raked or hand-turned for about three weeks. Care is taken to protect the beans from rain at this stage. Once the beans contain only 12% of the moisture content before drying they are sent to a factory where the dried skin, pulp and parchment are removed. Next, the so-called green beans (unroasted beans) are polished, graded and bagged. The flavour of coffee is determined by various factors, including the species and variety, the terroir, climate and altitude where it is grown, the care taken during picking, and whether the beans have been wet-processed or dry-processed. Some critics say that dry-processed coffee is inferior to wet-processed coffee. Yet many coffee lovers enjoy Ethiopia’s earthy, smooth and full-bodied coffees which are mostly dry-processed. Indonesia: massive body, low acidity*, sweetness, earthy and mushroom-like aroma. *IMPORTANT: Acidity must not be mistaken for sourness. Acidity in coffee refers to sharpness in taste detected towards the front of the mouth and it denotes quality as expected from coffee grown at high altitudes. Coffee from a specific estate is known as single-origin coffee. Coffee from a specific region is referred to as coffee of origin. When coffees from different estates, regions and/or countries are mixed to achieve a certain characteristic it is called a coffee blend. Blending also offers a way to ensure constant aroma and taste during times of erratic supply of preferred coffee. It is estimated that the coffee bean contains over 2 000 chemical substances. Flavour is developed when heat changes or breaks down these chemical substances into hundreds of volatile aroma compounds. This is called pyrolysis. The actual roasting begins when the temperature inside the bean reaches around 200°C, though different varieties of beans differ in moisture and density and therefore roast at different rates. During roasting, caramelisation occurs as intense heat breaks down starches in the bean, changing them to simple sugars that begin to brown, changing the colour of the bean. Sucrose is rapidly lost during the roasting process and may disappear entirely in darker roasts. During roasting, aromatic oils, acids and caffeine weaken, and change the flavour. At around 205°C, many other oils start to develop. One of these oils is caffeol, which is largely responsible for coffee's aroma and flavour. Depending on the colour of the roasted beans, they will be labelled as light, medium light, medium, medium dark, dark, or very dark. A light to medium roast that showcases acids (sharpness, not sourness) can be light in body as it lacks those caramelised sugars that give body and mouth-feel to a darker roast. The darker the roast, the more uniform all coffees taste. A darker roast may also sweeten some coffees, but beyond a certain degree of roasting all coffees become bitter. On the other hand, a light roast is seldom used as it shows all the flaws in coffee beans (which disappears in darker roasts), like that unpleasant sour taste. After oil, coffee is the second-most traded commodity in the world. Many coffee-producing countries are poor and huge sections of populations depend entirely on their coffee production as a means of survival. Fair Trade Certified Coffees: These coffees guarantee consumers that strict economic, social and environmental criteria were met in the production and trade of the coffee. Bird Friendly and Shade Grown Coffee: There are strong movements to promote Bird Friendly and Shade Grown Coffee. This is intended to preserve the natural habitat of many song birds and it also reduces the need for fertilisers and herbicides. Despite this, shade-grown coffee often tastes better, having a similar effect as high-altitude grown coffees.